The risks from carbon monoxide exposure rise when the temperatures drop and fuel-burning equipment gets turned on for warmth. Now is the perfect time to schedule a security maintenance check of all devices systemwide. 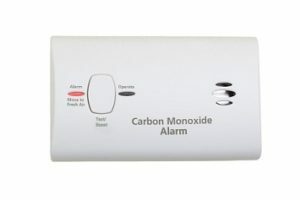 The “Silent Killer” is carbon monoxide (CO). A poisonous, colorless, odorless, and tasteless gas, CO is produced as a by-product of combustion. If fuel-burning (nonelectric) equipment is running in a facility, and CO detectors are not installed or working properly, there is an increased risk for exposing occupants to CO poisoning. In addition to natural gas or heating oil, there is also potential for CO from charcoal, gasoline, kerosene, wood, propane, and gas hot water heaters, grills, fireplaces, stoves, and room heaters. When inhaled, CO prevents your body from properly breathing in oxygen. It affects all vital organs, including the heart and the brain. CO poisoning can happen quickly or can occur slowly as gas levels build up over time. According to the latest figures from the Centers for Disease Control and Prevention, from 2010–2015, a total of 2,244 deaths resulted from unintentional CO poisoning, with the highest numbers of deaths each year occurring in winter months. In 2015, a total of 393 deaths resulting from unintentional CO poisoning occurred, with 36% of the deaths occurring in December, January, or February. The severity of CO poisoning is based on the concentration of CO in the bloodstream. People who have been exposed to CO experience a range of symptoms that may include headaches, confusion, drowsiness, dizziness, burning eyes, and loss of consciousness, and exposure could result in brain damage and death. Children, seniors, and people who have preexisting respiratory or heart conditions are often more sensitive to the effects of CO. In commercial settings, it is typically caused by improperly used or malfunctioning equipment. While regular maintenance and inspection of gas-burning equipment can minimize the potential for exposure to CO gas, properly installed CO detectors are the only sure way to know that no potentially life-threatening buildup of gas exists. Biomimetic sensor: A gel changes color after it absorbs a certain amount of CO and triggers an alarm. Metal oxide semiconductor: Silica chip circuitry sends an electric signal when it detects CO.
Electrochemical sensor: When CO is detected, electrodes immersed in a chemical solution release electrical currents to trigger the alarm. CO detectors can be battery-powered or hardwired and integrated into the security system. Regardless of the type of detectors used, they must conform to Underwriters Laboratory standard for CO detectors UL 2034. NFPA 720, the Standard for the Installation of Carbon Monoxide Detection and Warning Equipment, includes similar requirements for the installation of CO alarms, along with additional requirements concerning power supplies, installation, maintenance, and testing.